At Per Stirling, we have always operated under a concept that we call “business karma”. Simply stated, it is a belief that “if you take outrageously good care of your clients and treat the members of your team like family, everything else will take care of itself”. Abraham Lincoln championed a similar philosophy when he stated, “Don’t worry when you are not recognized, but strive to be worthy of recognition”. 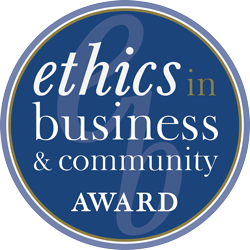 While we have always endeavored to be worthy of recognition for the sake of a job well-done, we are nonetheless very proud and very gratified now that recognition is increasingly coming to the firm, with the single most important commendation being Per Stirling’s selection as the winner of the 2018 Ethics in Business and Community Award (Small Business Category) after being a top-three finisher for the award in 2017. On a local level, Per Stirling has also been named for the past two years by the Austin Business Journal as One of the Best Places in Austin to Work (#6 in 2018 for companies with under fifty employees). Finally, and serving as evidence that “if you take outrageously good care of your clients and treat the members of your team like family, everything else really does take care of itself”, the July edition of Financial Advisor Magazine just listed Per Stirling as the third fastest growing Registered Investment Advisor in the country (with assets of at least $250,000,000). We are proud to have a team of 32 extraordinary professionals, of whom 23 are financial advisors, including,12 Certified Financial Planners, 2 Certified Public Accountants, a Chartered Financial Analyst, an Accredited Estate Planner, a Chartered Life Underwriter, a Certified Divorce Financial Analyst, a Chartered Financial Consultant, and a tax attorney. Over the past two years, we have added a second office in Austin and a new office in Dallas, and we are working right now on adding advisors in Houston and San Antonio to form the cornerstone of new offices there. Our goal is to replicate in Dallas, Houston and San Antonio the pool of expertise and collaborative culture that we have been able to build in Austin. We view smart and selective growth as a means of further building upon the firm’s resources and expertise to the ultimate benefit of our clients. Members of our team are also being recognized for their expertise, and are being regularly quoted in publications around the world including The New York Times, The Wall Street Journal, BBC, US News & World Report, Fox Business News, CNBC, Reuters, and others. We have a long list of people to thank for helping to make Per Stirling what it is, and as is the case with almost everything regarding our company, it starts and ends with our clients, without whom none of this would even be possible. Thank you!